What is the master of the micro tip doing reviewing an 0.9mm pencil? 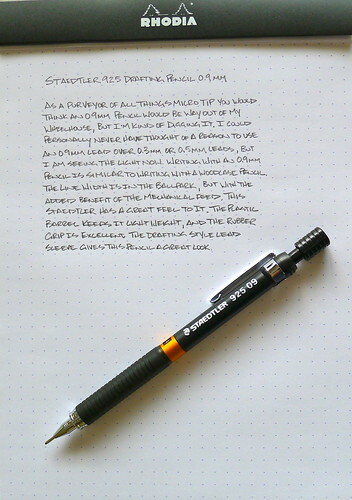 I thought the same thing when I ordered the Staedtler 925 Drafting Pencil, but sometimes you have to step out of your comfort zone a little bit to realize there are some really great products out there. This Staedtler is one of them. I hedged a little bit by going with the plastic barrel 925 as opposed to the more expensive 925-25 and 925-35 aluminum body pencils. I wanted to get a feel for the 0.9mm lead more than anything, and as it turns out, I really like it. The base 925 model has a black plastic barrel, rubber grip, and a different colored lead grade indicator for each lead width (orange for 0.9mm). The eraser is standard drafting pencil fare, which is why I always recommend a stand alone eraser for this type of pencil - something like the Uni-Ball Boxy. I found out quickly that I like the 0.9mm lead width when taking notes. It feels weird to compare a pencil to a pen, but the output to me is similar to that of the Sharpie Pen. Wide, bold lines, but very sharp and controllable. I don't think I would want to design the next Guggenheim Bilbao with it, but the lead width is great for sketching and wireframes. Does anyone have much experience with 0.9mm lead widths? I would love to hear what your uses are, so let me know in the comments section. Posted on July 15, 2011 by Brad Dowdy and filed under Drafting Pencil, Pencil Reviews, Staedtler.